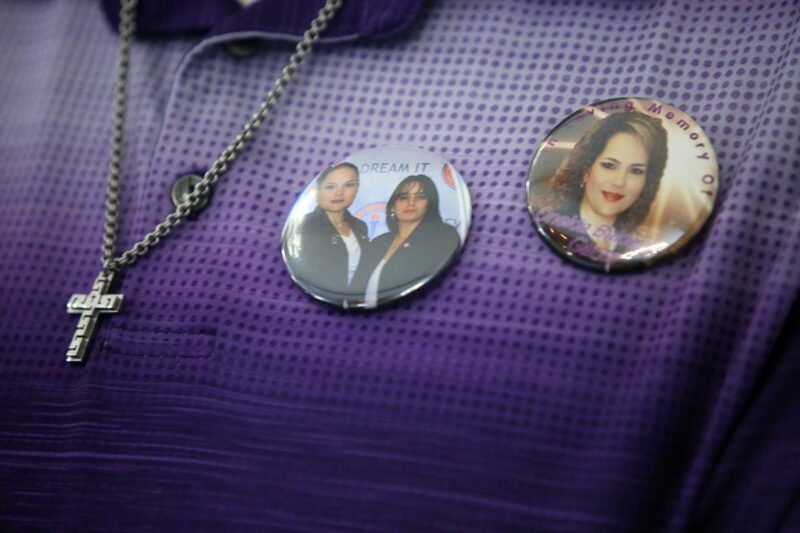 Worshipers during a Palm Sunday Mass remembered Oneida Balderas-Garza and Lordes "Lulu" Elizondo with buttons some wore at the Immaculate Conception Church on Sunday, March 25, 2018, in Rio Grande City. RIO GRANDE CITY — Two years have passed since two school district employees were found murdered in a local home, their hands bound and a bullet in each of their heads. There has since been little movement in the case, at least publicly, and residents are left to speculate as to who killed Oneida Balderas Garza, 44, and Lourdes Elizondo, 33, in execution-style shooting deaths during the early morning of March 23, 2016. The two women, who were found dead in Garza’s home, worked in the business office at the Rio Grande City school district and were in the midst of conducting a financial audit at the time of their death. Although Tom Vinger, an Austin-based DPS spokesman, directed requests for comment to Hernandez, as did the Starr County Sheriff’s Office, Hernandez wouldn’t divulge more. Starr County District Attorney Omar Escobar attributes the lack of information to the Rangers not wanting to compromise the investigation. For the citizens of Starr County, it can feel as though “there are monsters among us,” as one resident put it. Since Garza and Elizondo’s death, a father and his 3-year-old son were gunned down in an unrelated November 2016 incident at an intersection in Rio Grande City. While a suspect has since been arrested and indicted on two counts of capital murder, more suspects remain at large. More recently, in another unrelated incident, two brothers were reported missing in October 2017, the same day their vehicle was found burned and abandoned on the side of the road. Six months later, Mario Alberto Garza and Rosvel Garza are still missing. But unsolved murder cases are not unique to South Texas. Nationwide, it’s becoming harder for law enforcement agencies to resolve murder cases, Escobar said. The national “clearance rate” — or the chance police will identify the killer — for homicide is on the decline. In 2015 — the most recent data available — the FBI reported that the national murder clearance rate was just over 60 percent, down from 90 percent 50 years before. Some cases may take 20 or 30 years to solve, he said, or they could be resolved by tomorrow. While Escobar would not elaborate on these assumptions, residents have pointed to the fact that Oneida and Elizondo were working on a financial audit at the time of their death. The only search warrants that have been publicly confirmed were executed at the home of Elizondo’s former husband, Osdy Luna, and at JJ’s Cabinets and JJ’s Construction LLC. Luna, a former Starr County Sheriff’s Office investigator, was initially considered a person of interest in the case and was interviewed by the Rangers but never charged. He was terminated from the sheriff’s office in May 2016; no information was released about the reasons behind his termination. JJ’s Construction is owned by Juan Jose Aguinaga Saenz, a former school district contractor who was was arrested in November 2015 for allegedly forging and cashing district checks. The case has yet to go to trial, and it’s unclear how he may be connected to the murder investigation. Escobar said the Rangers do not have enough evidence to bring charges before a grand jury. The waiting game, paired with the absence of updates and information, is excruciating for the women’s families, friends and colleagues. The women’s friends are working to raise money to offer their own reward — in addition to the $10,000 offered by the Texas Rangers — for information about the women’s deaths. So far, Solis said, they have raised $7,000.